Fol­low­ing my Flash Vol. 1 write-up, Cap­tain Atom Vol. 1 is next on the read list. It takes place after Jus­tice League Vol. 1, and the Q-Pad is fea­tured fair­ly promi­nent­ly. Gen­er­al­ly very clean, but gets a bit chaotic in the fights. That could be an intend­ed design choice, though. He turned the inor­gan­ic [Air Force jet] into organ­ic [feath­er]. And he didn’t even need a rib to do it. This book intro­duces Nathaniel Adam (Cap­tain Atom), Dr. Ran­i­ta Carter, Dr. Hein­rich Mega­la, Dr. Scott Alexan­der, Mikey Park­er, and Gen­er­al Wade Eil­ing. Pan­do­ra gets her cameo in the Man­hat­tan bystanders as Cap­tain Atom neu­tral­izes the vol­cano. It is men­tioned that the Jus­tice League reject­ed him because they con­sid­ered him too unsta­ble. 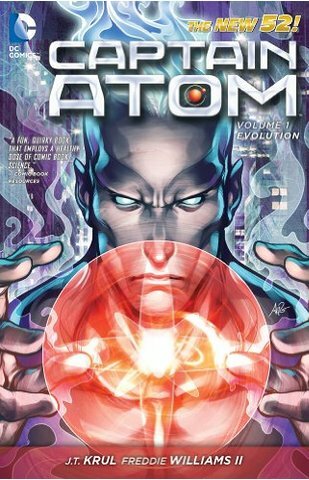 All-in-all, Cap­tain Atom just seems too over­pow­ered to be com­pelling. He either needs to be nerfed or meet a vil­lain that hon­est­ly chal­lenges him. Next up, Sta­t­ic Shock Vol. 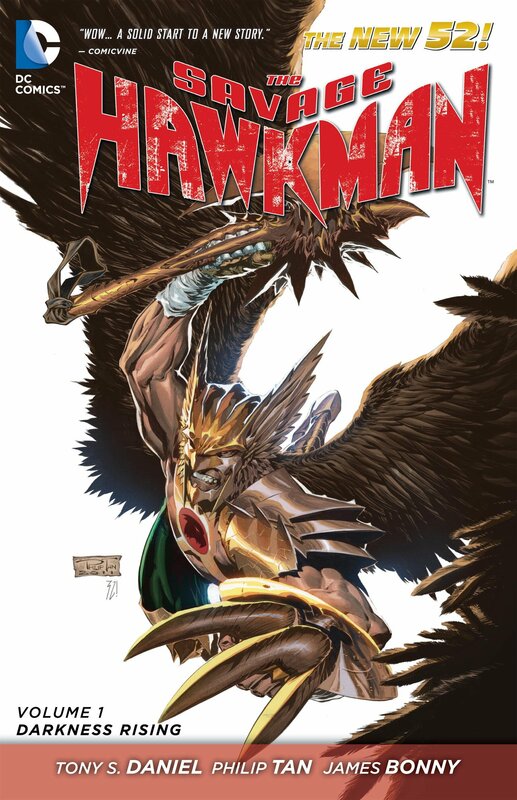 1 Sav­age Hawk­man Vol. 1. Fol­low­ing my Green Arrow Vol. 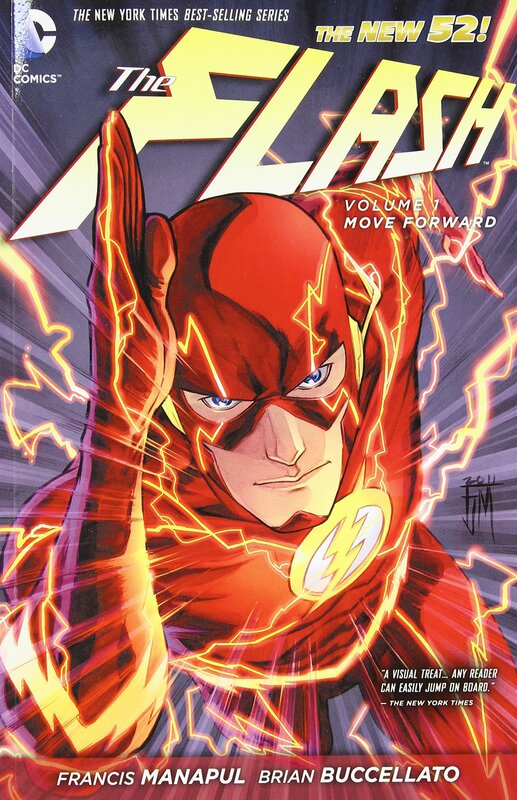 1 write-up, we “move for­ward” to Flash Vol. 1 on the read list. The clean lines and bright col­ors are fan­tas­tic. Every­one looks nat­u­ral, in and out of cos­tume. For any oth­er char­ac­ter, hav­ing the hero run straight for­ward in the frame might seem like poor stag­ing, but it works for Flash. In the mid­dle of his fight with Mob Rule, an unex­plained EMP blast throws a kink in the works. There’s also a jail break at Iron Heights Pris­on, which sets up Flash’s next con­flict with Cap­tain Cold. In the mid­st of that bat­tle, we find out that Flash’s speed is cre­at­ing worm­holes and he is inad­ver­tent­ly respon­si­ble for the pre­vi­ous EMP. At the same time, we see Goril­la Grodd con­sol­i­date pow­er at home, pos­si­bly fore­shad­ow­ing Flash’s fight in the next book. The segue from the Mob Rule sto­ry to the Cap­tain Cold one is stilt­ed, but I sup­pose it fits the the­me of always mov­ing for­ward to the next chal­lenge, and the plot­li­nes do come back togeth­er when you find out about the EMP con­nec­tion. Final­ly, Flash enters the Speed Force through the lat­est worm­hole in order to try to fix this lat­est dis­as­ter when he finds out that Tur­bine is stuck there and caus­ing the worm­holes in an attempt to free him­self, where­as Flash is actu­al­ly a Speed Force release valve to pre­vent worm­holes — a con­ve­nient abso­lu­tion and “fix” to Flash’s inabil­i­ty to use his speed more often. My biggest issue with this sto­ry is it is not clear how long Cen­tral City was liv­ing in the dark, it could be any­where from days to months — Pat­ty talks about Bar­ry being gone for a long time, but Lisa Snart prob­a­bly should have died with­out life sup­port for that long. This book intro­duces Pat­ty Spiv­ot, Dr. Dar­win Elias, Iris West, Manuel Lago (Mob Rule), James For­rest, Leonard Snart (Cap­tain Cold), Dr. Guer­rero, Rogues, Axel, Bryan, Nathan, Bur­rell, Cap­tain Dar­ryl Frye, Basilisk, Fold­ed Man, Gird­er, Tar Pit, Lisa Snart, Roscoe Hynes (Tur­bine), Hart­ley Rath­away. Pan­do­ra gets her cameo in the crowd out­side of the con­ven­tion cen­ter after Mob Rule’s attack. David Singh, intro­duced in Jus­tice League Vol. 1, is still Barry’s boss. Flash wran­gles some equip­ment from Wayne Enter­pris­es to help dis­as­ter relief in Cen­tral City. Dr. Dar­win Elias is the head of Mer­cury Labs. Green Lantern men­tioned in Jus­tice League Vol. 1 that he helped Flash take down Goril­la Grodd, but this is the first time we see Grodd, and it seems like that con­flict has not hap­pened yet. Next up, Cap­tain Atom Vol. 1.